Are you ready for a rewarding good time? Then make your way to Oasis Bingo in Harker Heights, Texas! We’re playing traditional bingo every day and invite you to join us for fun and the chance to win big. Our family-friendly bingo hall is open from 10:30 a.m. to 2:30 p.m. every day. Don’t miss out on fun and a chance to win big, join us and play at Oasis Bingo. Bingo is fun, but let’s face it, you’re here to win! At Oasis Bingo, we give away over $5,000 in winnings daily. That’s a lot of bingo cards. You don’t have to buy a lot of cards to win, though. Our traditional bingo system gives everyone a fair chance to win big and a certain possibility of having fun. Come to Oasis Bingo or contact us and get in on all the rewarding fun today. While other bingo halls have replaced the un-hurried, fun-for-all traditional bingo with faster-paced electronic systems so they can increase their profits, we’ve stayed true to the bingo you know and love. This style of bingo has worked for us and our guests since 1984, so why would we change it? 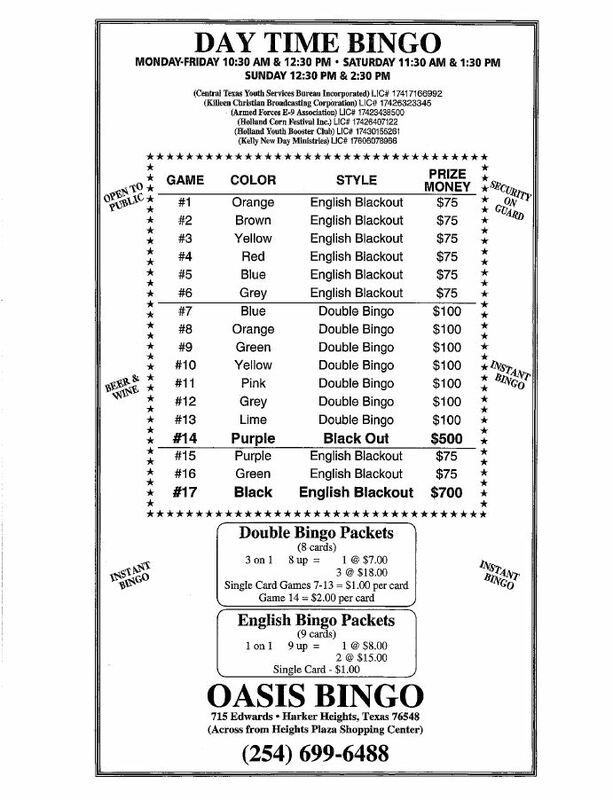 To experience bingo the old-fashioned way, as it was meant to be, come play at Oasis Bingo. We know you love to shout “Bingo,” so we give you many ways to do it. We offer two bingo sessions daily from 10:30 to 2:30 and give you the opportunity to play as much as you want. If a single game won’t satisfy your bingo craving, pick up some of our playing packages. Our packages are a great way to save a little when investing in the chance to win some serious cash!